We took Chazz to the fair this week, and boy did we have fun! Roman and I were a little nervous because we weren’t sure how Chazz would react to the rides. Well we should have known, our little adrenaline junkie would soak it up. At no time was he even remotely scared. He laughed hysterically, espesially on the mini rollercoaster. I think it was a great “first Fair” experience, and I am so glad Chazz had fun. And we didn’t check out the livestock or arts building (dangit!) I forgot my benadryl and we ran out of time! Can’t wait for next year, maybe animals and the Ferris Wheel are in our future?! Chazz had a follow-up appointment today with his Ophthalmologist, Dr. Weber. About a month and a half ago, he got his first pair of glasses and it was time to assess! Now understand that Optic Nerve Hypoplasia is an underdeveloped optic nerve (what sends the vision to the brain for “decoding”.) So glasses won’t improve his existing vision to 20/20 like with a “normal” eye, but there are two BIG reasons why he does need them. 1) Protection. Chazz is currently diagnosed as legally blind in his left eye and 20/200 in his right eye. (although we are convinced it is better than that!) The glasses serve as a protective barrier against any pokey object that could compromise what vision he has. 2) Correction. Since birth, Chazz’s left eye has had a tendency to wander when he is tired, and his right eye has become a little far-sighted from being much stronger than his left. Also, due to the two different images his brain is receiving from his eyes, it becomes trained to ignore one image, for Chazz his right eye (the one with better vision…). The glasses will strengthen the vision in his right eye, correct his far-sightedness, and help strengthen the muscles in both eyes to prevent any further wandering until his left eye can be surgically centered. Now try explaining that to a two-year-old to convince him why they need to stay on!!! (hint: doesn’t work!) The first week was a little bit of a battle, and some mornings he just doesn’t want to put them on. But over all, Chazz has done so well keeping them on. Basically, unless he is sleeping or in the bath, the glasses are on. and once Dr. Weber explained how the brain starts to ignore the differing images and that it isn’t easy to get it to restart that signal, we have been pretty dang adamant about it. Introducing the glasses was a bit of a struggle, but we made it clear that they help him see better and are to be worn always. I would say a proper fit is key if your little one gets glasses. Any sort of discomfort just adds to the madness! We brought Chazz back in twice to be re-fitted, and they said we were lucky. Also, a really cool glasses case is very important. I think because his case has cars on it, he was more willing to even try them on. Roman and I even popped the lenses out of old 3D movie glasses and rocked them along side him the first few days. We just wanted to make it a fun and easy transition. After he had them on for a bit, we had the coolest experience ever! Suddenly, everything up close that used to be a blur for him, was visible! I took him on a close-up “re-tour” of our home. The heart on his high chair table, the pictures hung on the wall, word magnets on the fridge, ALL THINGS HE WAS MISSING OUT ON! It was one of those mixed emotion moments for me, he was seeing so much clearer, yet I couldn’t help but think of all the things he had been missing. So fast forward to the appointment. Chazz walked right in there like he owned the place, repeating the words “eye doctor” which was adorable and hilarious at the same time. He knew what was up! His usual nurse checked him in and we sang our ABC’s and Twinkle Twinkle until Dr. Weber was ready. The appointment was pretty quick, he checked the fit of his glasses, checked his peripheral vision and pupil response, and asked how we thought it was going. We both agreed that the wandering seems to be less often and severe and that was about it. So his next check-up is in 6 months, and hopefully by that time Chazz will be able to tell US what he is seeing. And even try a picture eye chart for the first time. How exciting! As a kid, making new friends was as easy a sugar cookies, baby! And for Chazz, it is no different. And guess what?? HE LOVES IT! Emily has been with us since the beginning. I was so blessed to be able to take a 9 Month maternity leave, and just as blessed to have her to take care of our son while I work. Luckily, we found one we were pleased with. And it is actually close to work and home. Yay! I love how attentive the gals are, they have Bible hour, and they always seem to be cooking something yummy when we get there. They run through the sprinklers on hot days, and have an age appropriate playground for the kids. They even let me bring his own organic schmanic sunscreen and bug spray. Aaaand you have to enter a security code to even get in the door. Now the neurotic part of me LIKES that! So, so far so good. And while we sure miss Emily (Chazz still asks to go to Emy’s house 😦 ) we were quite lucky to find a somewhat comparable replacement. Chazz is adjusting well, is learning a ton, and making new friends. And panic attacks aside, Roman and I even survived! WordPress on my phone!! So here are some pics of our not so little man, since its been forever!!! Okay, really, let’s be honest. How often do you find yourself running around the house, frantically late for a playdate, trying to get out the door, get the kid’s socks on (or find one that matches…), and you still haven’t brushed your own hair?? Well, if your days are anything like mine, the answer is “Why, all the time!”. Sometimes busy days don’t always go according to plan. Which is why this quick yet healthy snack is always my Plan B, and everything is portable if you have to take this snack on the road! 1) Break Graham Crackers into quarters. I used honey, but I am sure the chocolate ones would be yummy too. 2) Spread Peanut Butter across the Grahams. Almond Honey Butter is also quite good. 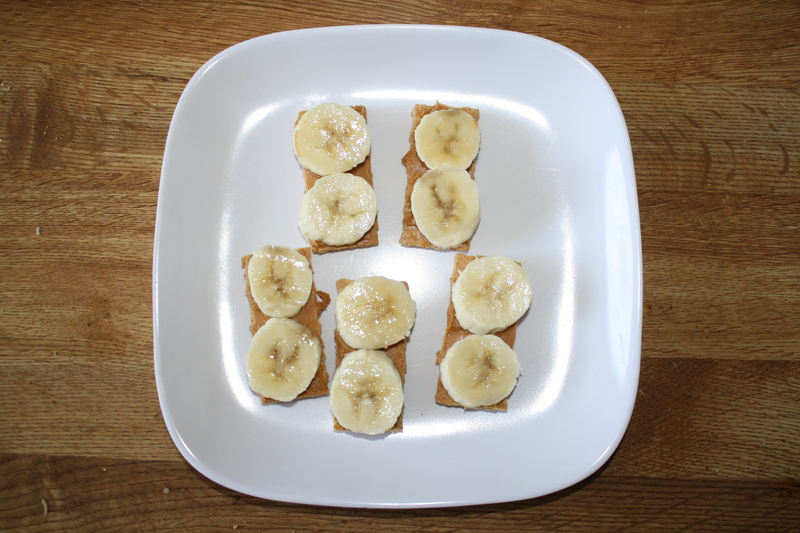 3) Top with sliced banana. We have also used diced apples, sliced strawberries, or diced pears to switch it up. 4) For younger kiddos, like Chazz, I top it with another Graham to keep it all together. Well, mostly. Now doesn’t that sound great?! Peanut butter is a good source of calories, just one Tablespoon has about 90 calories, it packs quite a protien punch, and is an excellent source of Potassium, Phosphorous and Magnesium. Top that with the Potassium, Iron, and Vitamin C from the banana slices, and you have one kid-friendly (and mom approved!) snack. But first, I need to catch you all up on the wonderfully strange world of toddlerhood. Chazz has been doing so many little awesome things lately. He does a lot of semi-coherent babbling. A few of his favorite words are milk (of course), die-uh-perr, tank you, and yelling “XBOX!! !” (our console has voice controls, and it won’t be long before he will figure that out!). Also he recognizes Elmo anywhere, and loves to point him out, on books, tv, and his toys. Chazz signs milk, water, eat, and most recently, please. Which is sweet to see. We were pretty lazy about signing to him the last few months, but he has really been picking it up since I re-started. As far as daily life? The kid drinks way too much milk (as in 2 gallons a week! ), dislikes the carseat and baths, loves the park, and I am just sure is a little rock star in the making. He dances, drums, sings, and moshes around our living room. Chazz just started sitting on his potty seat, rather than taking it apart for daily inspections 🙂 And today, I finally got his big boy day bed set up in the new house and he seems to like it better, and just might stay put, even without the side rail holding him in. The kid loves to climb stuff. Everything must be tested for its climbability! The entertainment center and windows have become favorites. Chazz will drag his potty or a big pot over as a step stool to get to stuff on the counters. Oh, he also thinks sitting ON the table is better than at it. Chazz even climbed the ladder on the 10 foot slide by himself multiple times last week. Without even looking back or seeming to care that he was WAY off the ground. I, of course, was about two inches behind him the whole way up. And he would turn around and slide down on his belly, laughing the whole way down. A heart attack for me, but apparently a blast to an almost two-year-old adrenaline junkie! So this is Mr. Chazz on the daily. Trying to climb everything, talking, and making every single day a mini-adventure.